What Happens when Digital Learning Day is Every Day? 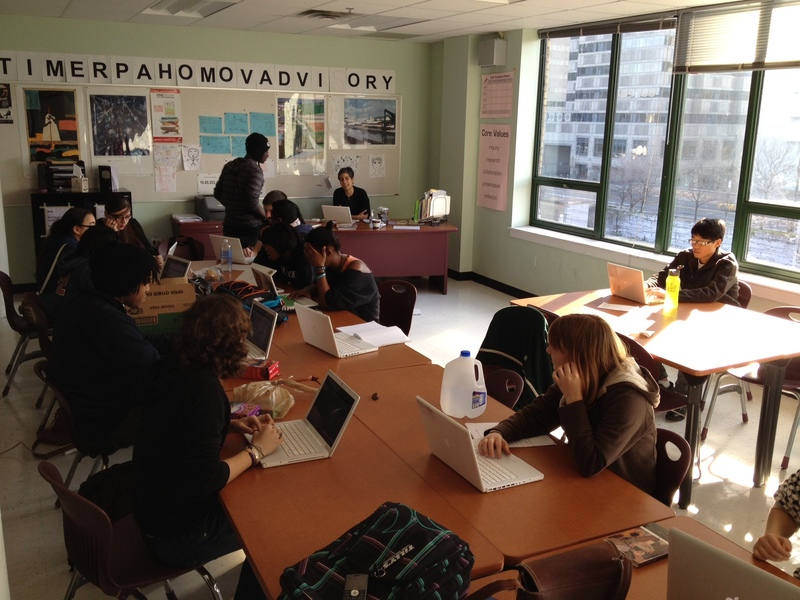 A typical Journalism class at SLA. Except I’m usually seated at the big table with everyone (really). Photo by Sam Lovett-Perkins. When students at SLA hear about “digital learning” at other schools, sometimes they are patient… and sometimes, just sometimes, they roll their eyes. They love that they belong to a community that’s on the cutting edge of technology integration in the classroom. They know the difference between moodle and drupal, about firewalls and bit torrents and advanced permissions. They have done more multimedia project work than most college students, and blogged way more than the average American. But by now they also know that all of this tech savvy is not the key to their education. They will be the first to tell you that the laptops are not what make SLA tick, and are so over the hype of their fancy machines. So, once you’re over the hype, what’s next? We’re in our seventh year as a school, and a big theme now is sustainability. What works, and can keep working in the future? What doesn’t burn out our brains or our laptops? What will students still be interested and committed to after a few years or a few decades? This focus on creating a sustainable system has carried over to the first-ever Journalism class at SLA. The goal from the beginning was to create a source for student-created media. So we asked ourselves — what does our community need? And what will attract them? With all that in mind, they came up with the name — SLAMedia. They picked the template. They wrote and revised the mission statement, and they manage and promote the site. They have a twitter feed, and a social media coordinator, and videos are forthcoming. Student-led learning is nothing new. What makes this so much more real is the digital medium. The building blocks are aren’t blocks at all, they’re malleable. They can build what they want, tinker with the pieces. Unlike some more “traditional” high school journalism programs, they’re not creating in the shadow of the old-school newspaper template. They’re building exactly what they think SLA needs, and creating a venue versatile enough to support what they haven’t even thought of yet. We’re now about four months into the project. For the first class of the New Year, we devoted a whole class to pipe dreams–no idea was too outlandish. They want so many different things! Field trips, and photo gallerys, and a better facebook presence, and more guest speakers, and oodles of schwag with our name printed on it. So on Digital Learning Day, what can you do that will last? This piece is cross-posted on the NWP Digital Is Website. This entry was posted in Uncategorized on January 24, 2012 by lpahomov.